Consul Ringsby became President of Ringsby Truck Lines, Inc. in 1977, and served as Chairman and CEO from 1981 until the company's sale in 1986. 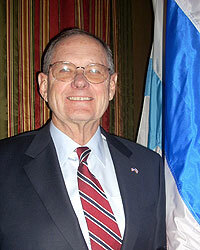 He was President and Chairman of the Board of Aspen Airways, Inc., from 1981 to 1990. From 1981 until 2007, Consul Ringsby served as Chairman, CEO, and President of Ringsby Terminals, Inc., where he currently is Chairman of the Board. He has sat or is currently sitting on the Board of Directors of Young Presidents Organization, the Rocky Mountain Chapter of YPO, Columbus Energy Co., Colorado Uplift, and the Investment Committee of the University of Colorado Foundation. He received his education at the University of Colorado in Boulder, Colorado. He has been the Honorary Consul General for Thailand in Colorado since 1980.